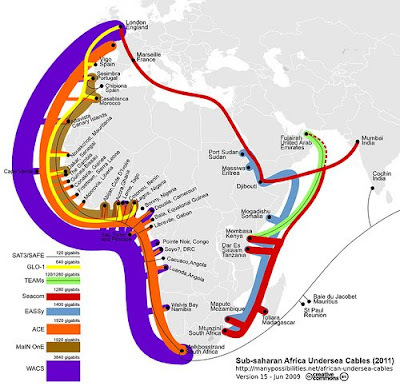 Steve Song, a Canadian researcher living in Cape Town, made this very interesting and informative map of telecommunication cables in Africa. While I was in Oman one of these major cables in the Indian Ocean was damaged and it seriously impaired my ability to surf the web and check email. Furthermore this map goes a long way towards illustrating the need for further bridges across the 'digital divide.' Especially in East Africa.